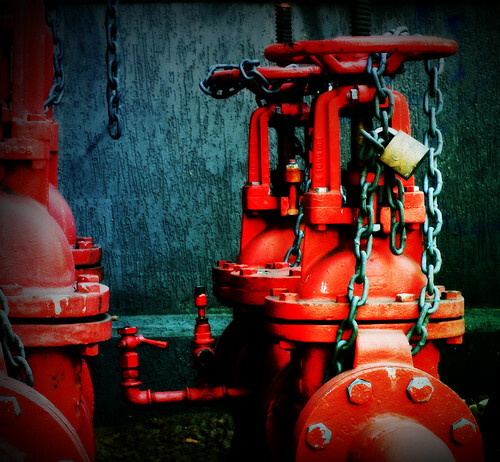 All valves, even a three-way valve, have an element in their design to inhibit or completely block the flow of water passing through them. A three-way valve will have at the center of the apparatus either a ball valve element, globe valve element or gate valve element. The element determines how the flow of water or other liquid is channeled through the three ports in the valve. The most typical three-way valve is the ball valve. By changing the position of the ball valve, water or other liquids will flow along a route to one of the three ports. A ball valve element is a spherical component in a three-way valve that has an opening straight through it. The ball valve element turns on its axis on a ring valve seat inside of a three-way valve, either exposing the opening or turning it away from the valve opening (where the pipe, tubing or hose meets the valve). A handle is mounted on the exterior top of the valve for opening, closing and controlling the direction water flows through the three passages in the valve. A full-bore three-way valve has a ball element with the opening measured to the exact size of the pipe interior. The significance of a full-bore three way valve is continuous, even pressure flowing through the pipe. Additionally, the gland seal is less prone to leaks. When a three-way valve has a globe element (also called a needle valve) at its core, the flow rate through the pipes connected to the valve is manageable. This means that the operator is in control of how much water comes out of the piping. A valve plug sits inside of the three-way globe valve. This valve plug closes the valve completely when it is in contact with the plug seat (the plug seat sits at the bottom of the three-way valve fixture). When the operator turns the knob on the three-way globe valve, the valve plug rises off of the valve plug. When the operator continues to turn the knob, the flow rate through the pipes is increased. Aside from the turning knob, a valve lever is attached to the three-way valve fixture for changing the direction of the water flow to different pipes. Gate elements work to block the passage of water or other liquids in a three-way valve. A gate element is lowered from the top of the valve into the path of the water/ liquid flowing through the pipe. A knob or lever controls the gate element from the top of the three-way gate valve fixture. With a knob-controlled gate element, the water flow rate is manageable (turning the knob only part way will allow only some water to flow).